If you are looking for a summer getaway, Amangiri Resort & Spa in Canyon Point, Utah is the perfect destination, with stellar service and amazing plateau views just outside of my room, I couldn't ask for anything more. 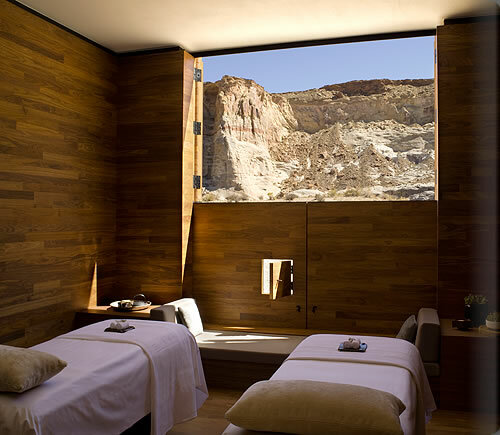 Amangiri, ‘peaceful mountain’, is located in the southwest region of the USA also known as the Four Corners, where the states of Utah, Colorado, New Mexico and Arizona meet. 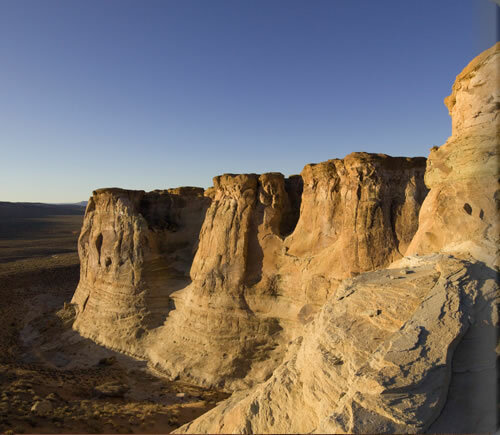 Boasting one of the most dramatic landscapes in the USA with deep canyons and towering plateaus, the region has been home for centuries to the native Navajo and Hopi tribes yet is sparsely populated and presents the raw landscape for which the American Southwest has become famous. Rarely do I cover any trips or events outside of New York City, but this trip was so memorable that I had to make an exception. 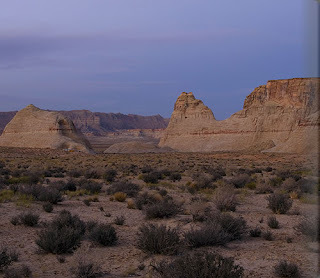 There is a nearby airport in Page, AZ (about a half hour away), but Chris and I opted for the long, scenic route by flying into Las Vegas and driving the 4.5 - 5 hours to the resort. 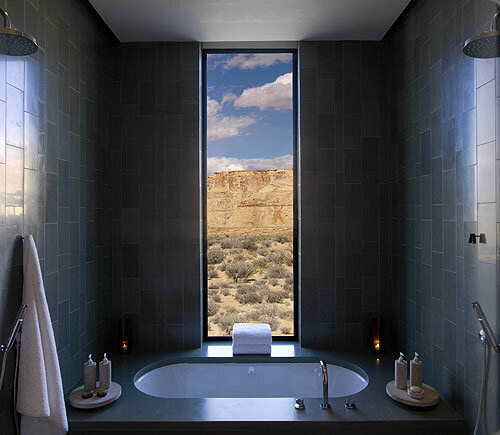 Be careful not to miss the Amangiri sign - it's easy to miss if you are not looking out for it. Once we got there and made our way past the gated entrance and winding road, we were greeted out front and escorted to the check-in area, while our bags immediately taken to our room. At the check in desk, we were both given an ice cold towel and glass of lemonade (which I greatly appreciated given how hot it was outside)! As Louise took us on a tour of the resort, I was excited to experience everything the resort had to offer. My favorite area is the main Swimming Pool within the Pavillion, with a huge rock escarpment in the center of the pool. Also within the Pavillion is the Living Room, Gallery, Library, stocked with books and magazines, Dining Room, Private Dining Area and Wine Cellar. 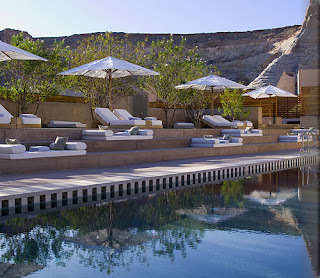 Next we were taken through the Desert Lounge, perfect for star-gazing and equipped with a telescope, Aman Spa, Yoga Pavillion and Fitness Centre. Swimming Pool area features king-size daybeds and twin sun-loungers, hot tub and adjacent enclosed courtyard. 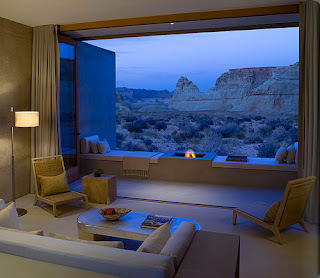 We were then taken to our suite, which is part of the Desert View suites. The entrance to our suite opens up to a private courtyard including a dining area. 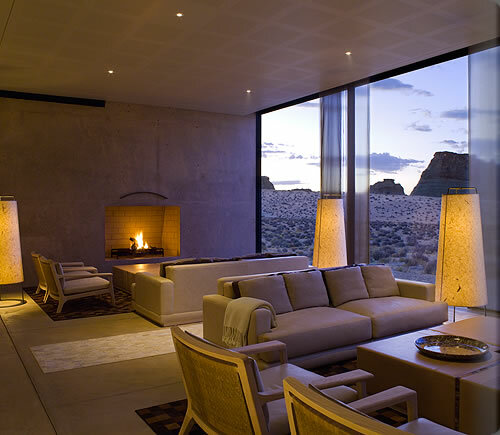 My favorite part of the suite is the desert lounge, with bi-folding concertina glass doors, resting mattresses and fireplace in the center. 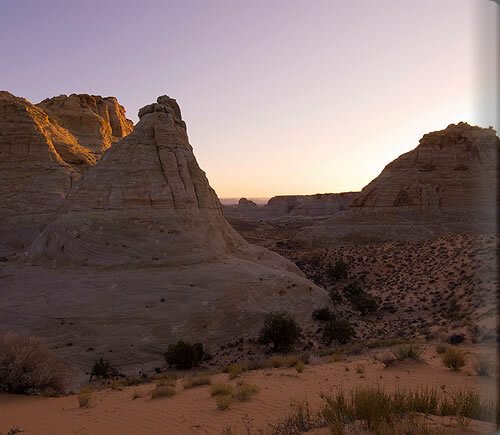 The views of surrounding dunes and plateaus are breathtaking during the day, followed by an amazing view of the stars at night. The night sky was so clear - you can see several shooting stars. The bathrooms were huge, with a spacious soaking tub, twin rain showers and a large vertical window with an amazing view. I was absolutely addicted to the Desert Sage shampoo, shower gel and bath salts, and with the conditioner, lotion and soap also available in full-size containers. When I found the gift shop later on, I found you can even purchase full size bottles of the Desert Sage, and even shampoo and conditioner pumps that are in the suite. There are so many decorative, interior pieces in the suite - what a great souvenir to take part of the resort with you and add to your own home.I was excited to hear that the entire mini bar was free, including Dagoba chocolate bars, kettle corn chips, gummy peaches, an assortment of nuts, water, organic juices and more. I couldn't help but bring my laptop with me, and was happy to hear that free Wi-Fi throughout the suites and public areas of the resort. Our Desert View Suite was the least expensive of the 7 suites types available, at $1,000 per night. There are a total of 34 suites, including 13 Desert View Suites, 14 Mesa View Suites, one Terrace Suite, two Pool Suites, two Terrace Pool Suites, the Girijaala Suite, and the Amangiri Suite, the largest of the suites, upwards of $3,500 per night with extra features including a private swimming pool and terrace. 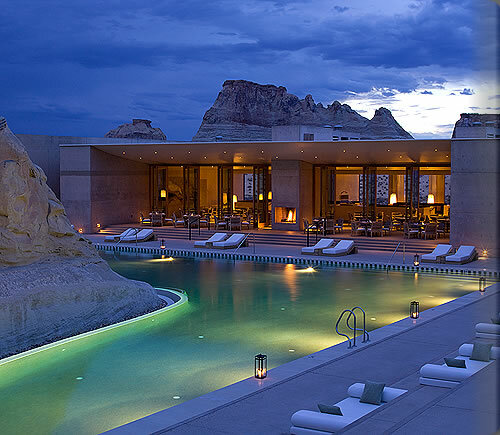 I definitely felt that my stay at Amangiri was worth the $1,000 per night rate. Louise had left us with a Friday and Saturday morning itinerary, which included an 8:00 am one-hour group yoga class and complimentary one-hour tour guide hike at 9:30 am. I decided to do the Friday morning yoga class followed by the hike. The morning yoga class was calming, relaxing and meditative. The yoga studio had an amazing open view. Kate led the small 4-person class, and did a great job of starting our day right with natural and positive energy. Many thanks to her for telling me about the lemon zucchini cookies up by at Jacob Lake! The lemon zucchini and gingersnap cookies are amazing! Yermo was our hiking tour guide and was very knowledgeable of the plateaus, rock formations and local history. He has worked as a consulting archeologist, where he has excavated, mapped and recorded sites and is also an accomplished jewelry maker. He really made our tour worthwhile, taking us on a two and a half hour tour rather than the scheduled one-hour tour. It was my first time really hiking, and Yermo made us feel very secure and safe during our hike, while educating us on the surroundings. The surrounding views were amazing as we continued to explore and hike up. I'm really sad to say that we only hung out at the pool and hot tub on Friday afternoon since we were tired when we arrived Thursday evening, Saturday we spent the day off-site and Sunday morning we had checked out at 7am to get an early start to head out to the North Rim of the Grand Canyon. I didn't even have enough time to try out any of the spa services. I would have liked to try out a one-hour massage, which was reasonably priced at a resort for $150. I think staying at the resort for one week would be ideal, as there are many things to do around the area. You can even request using the resort's BMW Z4 or 6 Series vehicles to do your own off-site exploring for the day. Aside from hiking tours, you may also enjoy horseback riding, hot air balloon rides, private off-roading tours, private scenic aerial flights, fly fishing, boating and kayaking. On Saturday mid-morning we tried to go kayaking at Antelope Point Marina, but they didn't have any kayaks left by the time we got there and then it got really hot - so be sure to go early! 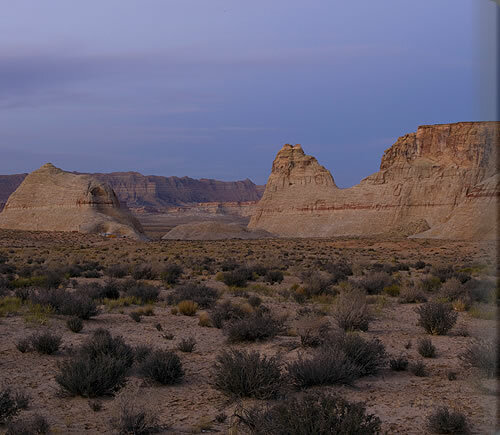 So instead we ended up hiking around Wahweap at Lake Powell. If you valet your car I must point out how incredible the valet staff was - when we called for our car, we hopped in to find the air-conditioner on and cold water bottles in the front seat. If you need to go to the store, there is a Safeway and Wal-Mart in Page, AZ, which is a half hour away from the resort, in which you also jump into Pacific Standard Time (Canyon Point is on Mountain Standard Time, two hours behind Eastern Standard Time). On Saturday night we had dinner in town, but for the first two nights we had dinner at the resort, which I thought was delicious. The first night I had the roasted chicken with polenta and vegetables ($32). It was just the right amount of food. I love sea salt, so I was happy that it was available along with pepper at each table. The next night I had the beef tenderloin ($42). In my opinion, I thought the dinner was reasonably priced. 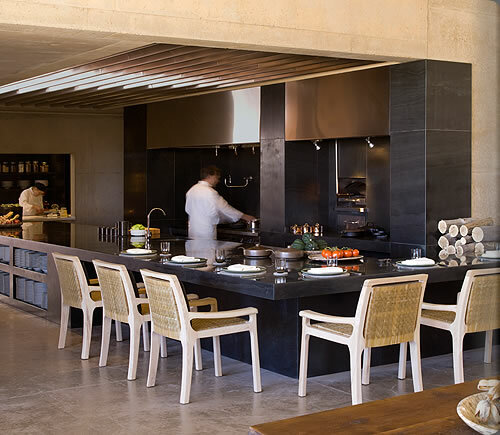 The chefs cook and prepare the food in an open-kitchen area. The first night we had dinner poolside, but upon request you can have dinner anywhere in the resort you would like. 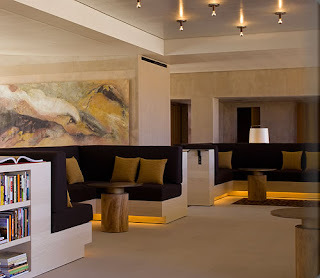 We could have even opted to have a candlelit dinner in the dining area of our suite, or in the desert lounge, which would have been nice and romantic. Walking around the resort at night, I really felt like I was at the site of a James Bond film. The walkways were open and lighted by candles, with a wood-burning aroma nearby. 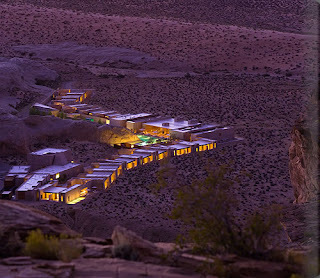 The resort itself blends into the landscape, with natural hues, materials and textures as features of the design. Fire, water, and wood are also elements incorporated into the design. You can tell there was a lot of thought put into creating this resort. It was the most peaceful place I could have possibly been. It is a serene and quiet environment, with no worries of mosquitos or other annoying bugs or insects. I was surprised to see a few young kids around, but they seemed to keep themselves well entertained at the pool and in the library, which also had a supply of fun board games and chess. 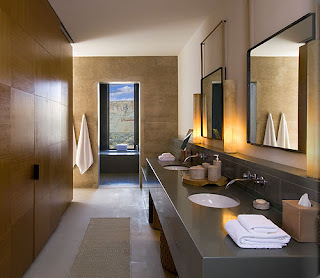 The minimal amount of suites creates a very tranquil, intimate environment with very few people around. I am very grateful and privileged to have experienced the complete opposite of my everyday stress, running around, pushing and shoving and crowded mobs in the city. You willingly find yourself losing track of what time or day it is. I feel as if I have only touched upon my experience at Amangiri. The resort had only opened in October 2009, and has an extremely worldly, friendly staff from all different countries. It was a very personalized stay, and it felt like the staff knew exactly who you were. I can't say I've ever experienced a trip quite like this, and I don't think I would have ever went exploring in this part of the United States had it not been for this trip. 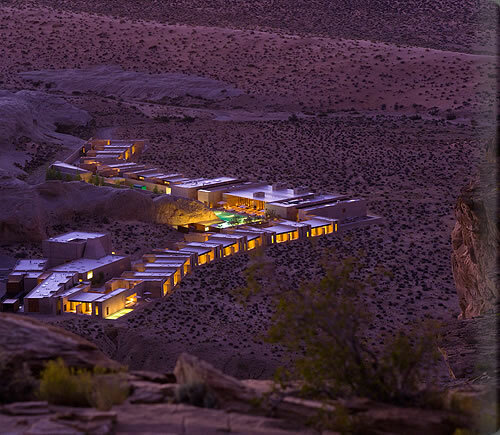 A big thank you to Amangiri for all the hospitality and thought in creating a very special place, and to Chris for taking me there.Click here to learn more about Amangiri. To learn about Ama Resorts worldwide, go to amanresorts.com. On the wall of the Desert View Suite are useful accessories that guests can use - purse with flashlight, umbrella, hat, walking stick and tote.